As the final votes are tallied from the Iowa Caucuses, the two winners, Senator Barrack Obama (D) and former Arkansas Governor Mike Huckabee (R), it's worth looking at their biofuels position again. Both clearly understand the importance of renewable fuels in the heartland. But as the campaigns now move to other areas of the country, it will be interesting to see if their public comments match their previous commitments to biofuels. And of course, the other major candidates still remain in contention for their party's nominations. 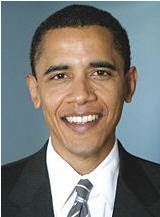 "Develop the Next Generation of Biofuels - Deploy Cellulosic Ethanol: Obama will invest federal resources, including tax incentives, cash prizes and government contracts into developing the most promising technologies with the goal of getting the first two billion gallons of cellulosic ethanol into the system by 2013. Less than 10 percent of new ethanol production today is from farmer owned refineries. New ethanol refineries help jumpstart rural economies....Barack Obama believes we must ensure that local investment continues to play a significant role as the biofuels industry continues to expand and evolve." Finally, Senator Obama recently appeared at an ethanol plant opening/tour in Iowa. Dr. Zeiger from the Fields to Fuel Institute has a video of his remarks made that day, available HERE. We've found a few key points from former Arkansas governor Mike Huckabee. After a bit of site searching, a few points worth mentioning include support for energy independence, support for American agriculture and biofuel production. We especially liked the "we need more ethanol" statement. "We must help our farmers lead the way to energy independence." "Besides growing our food, our farmers are growing our energy and leading the way to energy independence." Achieving energy independence is vital to achieving success both in the war on terror and in globalization. Energy independence will help guarantee both our safety and our prosperity. As always, FoodandFuelAmerica.com does not support or endorse any candidate for any office. We're just highlighting the public positions of major candidates regarding energy and food and fuel issues.